Artwork by Maurizio Cattelan. Online sales. 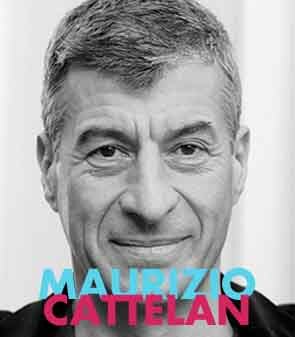 Maurizio Cattelan, is an eclectic, ironic and irreverent character and one of the most important italian contemporary artist. In the 90° years he captures the attention of the art contemporary's world with the artwork: "Strategies", a paper's castle composed by covers of the famous magazine Flash Art. He has a difficult relationship with all the contemporary art system, in fact one day, during one of his operation he hangs on the wall his curator with the scotch. One of the most important artworks is "The Ninth Hour", a sculpture which represents Pope John Paul II°, positioned on a side hit by a meteorite. Another important work which has aroused a big sensation in Milan, is: L.O.V.E., a sculpture located in Square of Business, in front of the Midnight Palace, which is the venue of the Stock Market of Milan, a palace made in fascist period. In 2008 he receives the Career Prime in the XV four- year Roman Art. 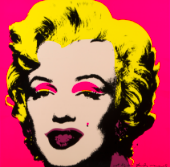 Now he is one of the most quoted artist and he works in national and international field, arousing many controversy with his provocative works. A performance in 2013 is one of his biggest provocatives. Cattelan commissioned the duet of The Usual Idiots to collect the Francesca Alinovi Prime, conferred by the Academy of Fine Art in Bologna. Cattelan said to the comic duet of read a religious interpretation of his works, considered like "Sub Specie Religionis".